"Recent research, presented at the Copenhagen climate congress in March 2009, projected sea-level rise from 0.75 to 1.9 metres relative to 1990, with 1.1–1.2 metres the mid-range of the projection. 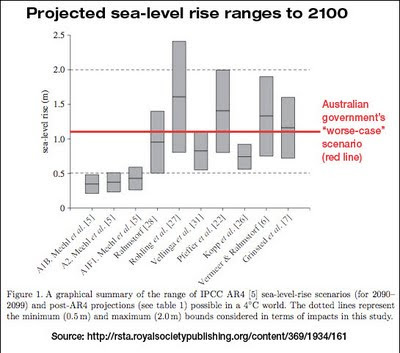 Based on this recent science 1.1 metres was selected as a plausible value for sea-level rise for this risk assessment". 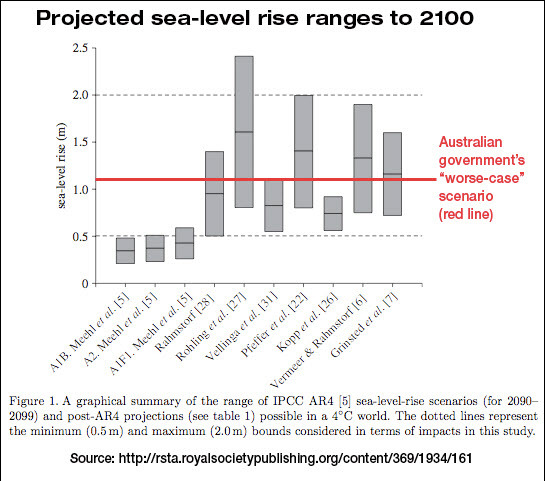 So a mid-range projection from the government’s own report in 2009, based on the peer-reviewed science, transmuted into a peculiar creature, a "plausible value", and now two years later "is about the upper end of the risk", which the Department of Climate Change knows to be wrong, as the literature also demonstrates. Pfeffer, et al. in Science conclude "an improved estimate of the range of SLR to 2100 including increased ice dynamics lies between 0.8 and 2 metres." Vermeer & Rahmstorf in Proc. Natl Acad. Sci. USA estimated a sea-level rise of 0.75–1.9 metres by 2100. A new report from Arctic Monitoring and Assessment Program finds "Global sea level is projected to rise 0.9 to 1.6 metres (3.0 to 5.3 feet) by 2100." 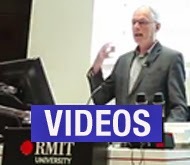 As Ross Garnaut has noted, climate science projections have sometimes been reticent when compared to observations. 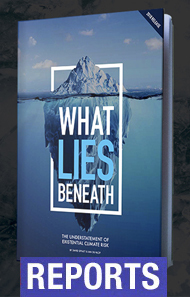 The 2007 IPCC report excluded the impact of melting ice-caps from its now-obsolete sea-level figures, and recent satellite data shows Antarctica and Greenland losing ice mass at an increasing (and possibly exponential) rate. 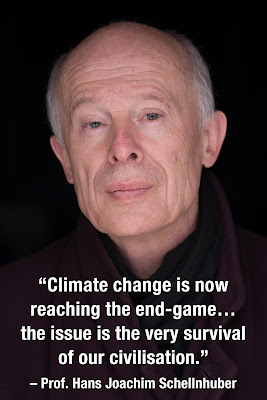 Dr David Carlson, director of the International Polar Year Program, says a "very plausible outcome" is a metre or more of sea level rise in this century from Greenland alone. And the West Antarctic glaciers also appear particularly vulnerable. So what difference would a metre make? A huge amount. The damage to buildings and infrastructure impacted by a 2-metre rise and associated storm surges is likely to be more than double the $266 billion figure established in the recent report, and it seems extremely foolish to neither recognise that possibility nor plan accordingly. Sensible risk management requires an assessment of the full range of possible outcomes, their impacts and consequences; not the average. By not doing so, the government is failing in its fiduciary duty. Communities and business, infrastructure authorities and local government planners are relying on the government’s assessment of sea-level rise risk to plan their future and make contingency plans. By simply ignoring the available science and failing to assess the risk associated with the full range of possibilities, the government may leave itself open to huge litigation should reality turn out to be closer to the scientists’ upper bound that the government’s "plausible value". Or perhaps we can leave it all to Senator Ron Boswell, who told an estimates hearing in February: "Being someone who has spent his life in boats, since I was a kid, I haven't seen any sea level change."